Hello tabletop gamers! I’m on a serious Dungeons & Dragons tear right now, so I’m going to talk about Lords of Waterdeep, a worker placement tabletop game with a D&D theme. Last month I wrote about libraries and gaming, specifically about investigating playing D&D with some of my library teens. So this month I’m going to continue to talk about the role-playing game, at least tangentially. While I love playing D&D and all my campaigns are currently set in the Forgotten Realms, I don’t really know too much of the backstory and lore of the setting. So this game originally held little appeal to me, because I don’t know that backstory, and it’s not really D&D. There are elements of the world, but you’re not making up a character or doing that wonderful collaborative storytelling that makes D&D other roleplaying games so amazing. Plus, it just looks pretty intimidating: The board is ginormous, and there are lots of little cards, meeples, and a million little wooden cubes. That combination makes the game look slightly less appealing. My boyfriend and I even set up and then subsequently put away the game twice before we decided to power through and play it. Don’t get me wrong, I understand why Wizards of the Coast would want to make a tabletop game—there are more than just Lords of Waterdeep, too—and it makes sense to set it in an already created world, but I do wonder if the fact that “Dungeons & Dragons” is attached to it scares off players who don’t role-play. But friends, here’s some good new for you: It’s not really a hard game! Don’t let the giant board, slightly obscure setting, and dozens of tiny cubes intimidate you. The game play is actually pretty simple and intuitive. The goal of the game is to get more points than the other person. DUH. But to do that you have to complete “Quests.” There are different category Quests, like “Piety” or “Commerce,” that have a one sentence role-playing part about the Forgotten Realms, description of the rewards that you get once you complete the Quest, and what materials you need to do so. So, you want to complete as many Quests as you can to get the rewards you want! Pretty simple! 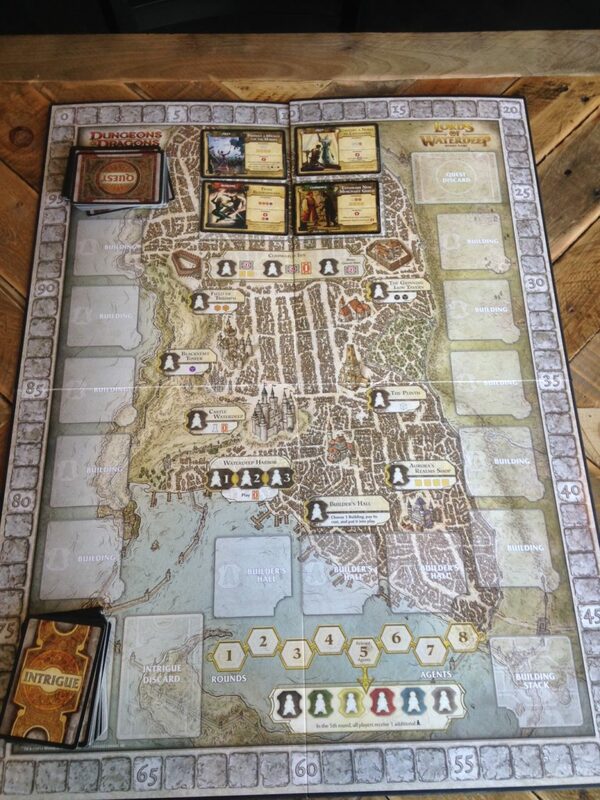 Each player is randomly assigned a “Lord of Waterdeep” representing a different faction, like the Harpers, that you may recognize from D&D and each lord, or lady, gives you different points for completing different kinds of Quests. One may give you bonus points for completing Arcana and Warfare quests or Piety and Commerce, and so on. This is the main function of the character cards; you don’t really do too much with them during the game except remind yourself what category of quests you want to be completing. Then you have four worker meeples (Side note: I have an irrational hate of the word “meeple” and have called game pieces “me-mes” since I was a child, but it has yet to catch on, and thus, I must use the inferior “meeple” to get my point across) who can go to all of the locations in the city of Waterdeep and collect the rewards for each space. For example, if you place your worker at the Plinth, you get the Plinth reward of one white cube. Other locations let you do other actions than just get resource cubes, like get more Quest cards or build a building which will get you points and other rewards. Each player can place a set amount of workers per turn; for two players, it’s four workers. Your workers can’t be in the same location as your opponents’ except in a few locations, like where you play Intrigue cards—more on those in a second—or acquire new Quest cards. Or if you have completed this awesome Quest, which lets you be in the same place as another player’s worker. Totally grab that Quest if it comes up because it’s a good one! The game only lasts for eight rounds, so you have limited time to collect and turn in Quests. This also means that the game is not incredibly long. You’d think it might be, because the board is so huge, but really it takes like 45 minutes to an hour to play. Not bad! You complete a Quest by paying the price on the card. In the game’s theme, you’re really recruiting rogues or thieves to do the Quests for you. The rogues and thieves are the little colored cubes, but I admit it seems a stretch. You can complete a Quest any time after you place a worker. And again, the more Quests you complete the more points that you get. I mentioned Intrigue Cards, and I know you were… intrigued, so here’s the deal with those. 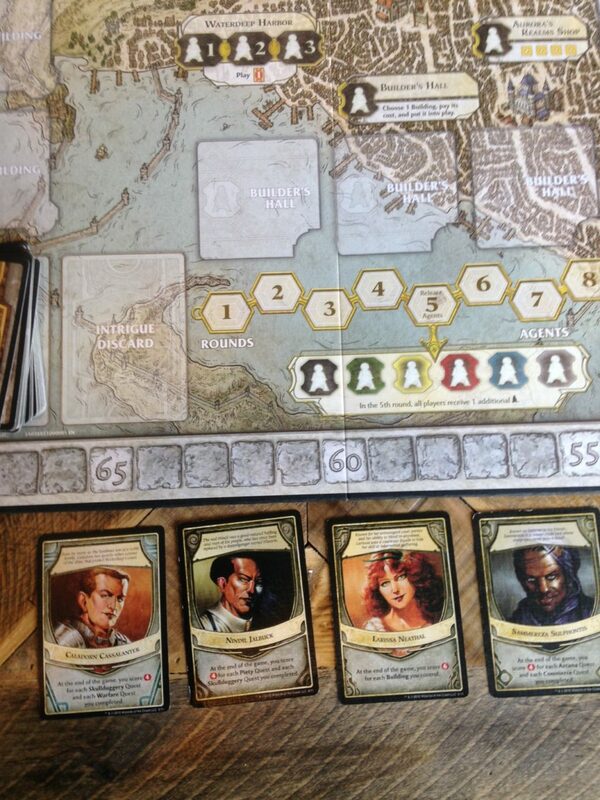 You can play them at the Waterdeep Harbor location. You start with one at the beginning of the game and can get more by completing Quests or visiting the other locations that give you Intrigue Cards. These cards do special actions that get you more resources, money, or let you perform additional actions. Sometimes you draw a mandatory Quest, which you give to another player, and they have to complete that Quest before any of their chosen Quests. I must say it’s super satisfying to hand over a Mandatory Quest. Ha! Progress stymied! At the end of eight rounds, you tally up your points from your Quests and any bonus points from your assigned Lord or Lady of Waterdeep. Then that’s it! I won the first game that I played, so it’s now cemented itself as a game I can win, and therefore, a game I’m more likely to want to play. What can I say? The impulse to want to win, even though I like playing games, because they help me not to focus on winning all the time, dies hard. 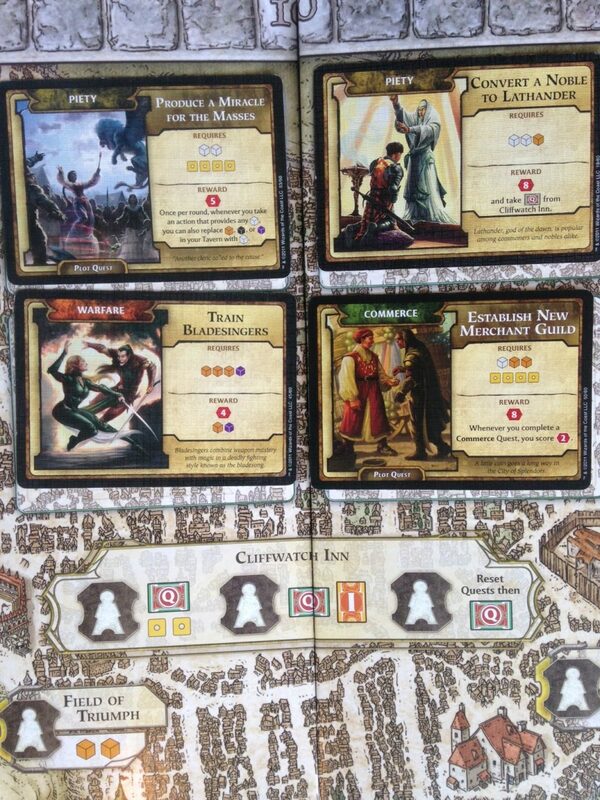 I do wish that you were able to pick your “Lord of Waterdeep” instead of having it assigned randomly to you. It’s fine, and I understand why randomization is important for balance and to dispel favorite characters and all that—blah, blah. But my usual rule for playing a game is that I want to play as a lady. It’s really disheartening to not be able to choose being a lady character. Again, it’s not the end of the world, but just something I’d like to change. Hear that Wizards of the Coast? Just let me play a lady! So, if you’re looking to get more immersed in the Forgotten Realms world of D&D or if you just want to play an awesome game with lots of little cubes, check out Lords of Waterdeep!